At the end of the school year, the Sisters of Notre Dame attended a Many Mansions award ceremony. They watched proudly as 20 students received academic scholarships, four of which were donated by the sisters. Sister Mary Joan Schlotfeldt was moved by ceremony. “I felt proud to be a Sister of Notre Dame and be able to help those who are pursuing an education,” she said. Many Mansions is a non-profit that builds and maintains affordable housing complexes for low-income families in Ventura County and the Conejo Valley. According to the Many Mansions website, the organization owns and manages over 500 units, housing about 1,000 adults and 300 children. They also provide on-site services including job training, case management, homework literacy, free summer camp for kids and a scholarship program called Vicky’s Fund. Sister Mary Lisa Megaffin first became involved with Many Mansions as a board member in 1995. While serving on the board, Sister Mary Lisa met Marty and Eileen Garcia. “When I first joined the board I had a lot to learn about affordable housing. Whenever we were deliberating a major topic, Marty would always ask ‘How does this relate to our mission?’ Our growing friendship and collaboration gave me opportunities to observe him, his faith and his concern for those in need,” said Sister Mary Lisa. 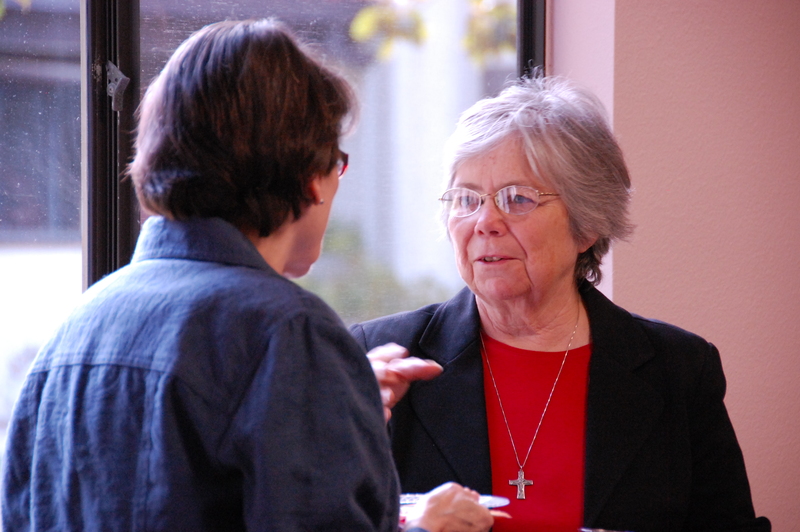 Sister Mary Lisa Megaffin at Notre Dame Center in May. Several years later, the Garcias became Associates with the Sisters of Notre Dame. The Garcias started Vicky’s Fund three years ago in memory of Marty’s mother, Victoria Garcia. A child of Spanish immigrants to the U.S., Victoria was only able to obtain a 4th grade education before she had to begin working to help her family. As an adult, she volunteered as a bilingual teacher’s aide until she was in her mid-eighties. “After my mother’s funeral, people came up to me and told me what an impact she had on them. She had an innate ability to recognize that the children in her classes couldn’t focus on their studies because they came from unstable home environments. She set out to make the classroom a safe place and build up their God-given talents and self-esteem. I asked myself what I could do to extend her vision. It dawned on me to start a scholarship within Many Mansions,” said Marty. In three years, 48 students have received a total of $23,000 in scholarships through Vicky’s Fund and Many Mansions. Scholarship recipients range in age and academic goals. Some are young students preparing for college, and others are adults earning their GED or taking vocational training classes. The main requirement for the scholarship is that the recipient is a resident at a Many Mansions property.